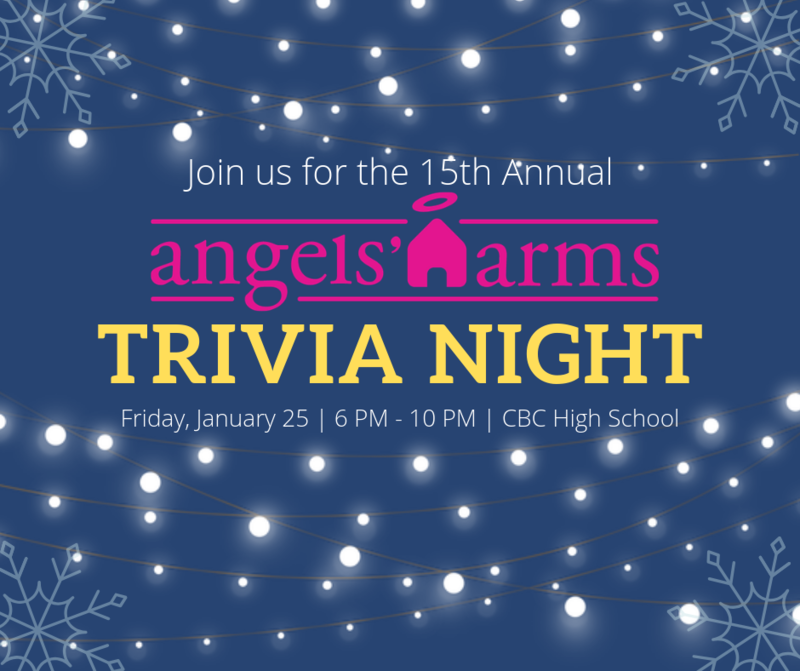 Join us on Friday, January 25, 2019 at CBC for the 15th Annual Angels’ Arms Trivia Night, hosted by the Kallaos and Kamburis families. Includes prominent seating, special recognition at the event, table runner, 3 free mulligans, and custom bottle service including liquor, wine, or beer of your choice. ALL TABLES include complimentary soda, beer, & light snacks. Teams are also encouraged to bring food & beverages. The event features a silent auction, raffles & games between rounds. *You must register tables of 8. Individual seats/registration is NOT available. 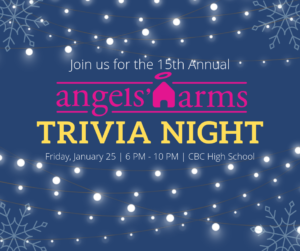 The 2018 Trivia Night was a sell-out event, hosting over 440 participants and raising $17,000 for the Angels’ Arms Family Activities Committee, a volunteer group which helps organize monthly events for our foster families throughout the year. The funds will be used to invite all Angels’ Arms foster families to a fun monthly activity which may include bowling, swimming, trips to the Science Center, Swing Around Fun Town, Bounce U, and so much more.